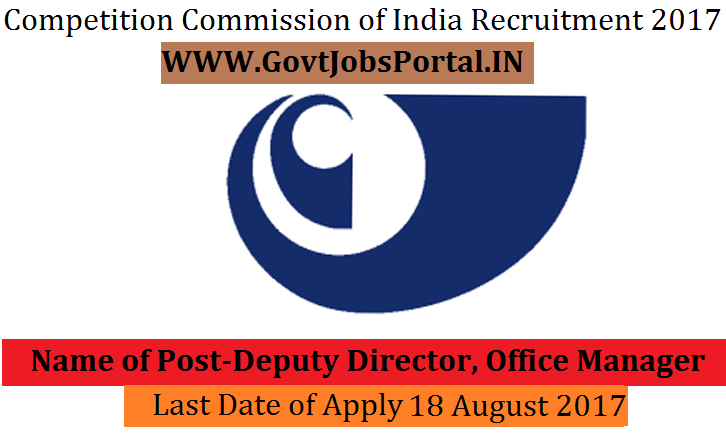 Competition Commission of India is going to recruit fresher candidates in India for Deputy Director, Office Manager Posts. So, those candidates who are willing to work with this organization they May apply for this post. Last Date of Apply 18-August-2017. Total numbers of vacancies are 31 Posts. Only those candidates are eligible who have passed Bachelor of Law / Master Degree in Economics/ Statistics / Commerce /Business Administration or Qualified Chartered Accountant/Company Secretary/ Cost and Works Accountant/ Financial Analyst or equivalent with three years experience. Indian citizen having age in between 18 to 33 years can apply for this Competition Commission of India Recruitment 2017. Educational Criteria: Only those candidates are eligible who have passed Bachelor of Law / Master Degree in Economics/ Statistics / Commerce /Business Administration or Qualified Chartered Accountant/Company Secretary/ Cost and Works Accountant/ Financial Analyst or equivalent with three years experience. What is the Application Fee for these CCI Jobs in India?